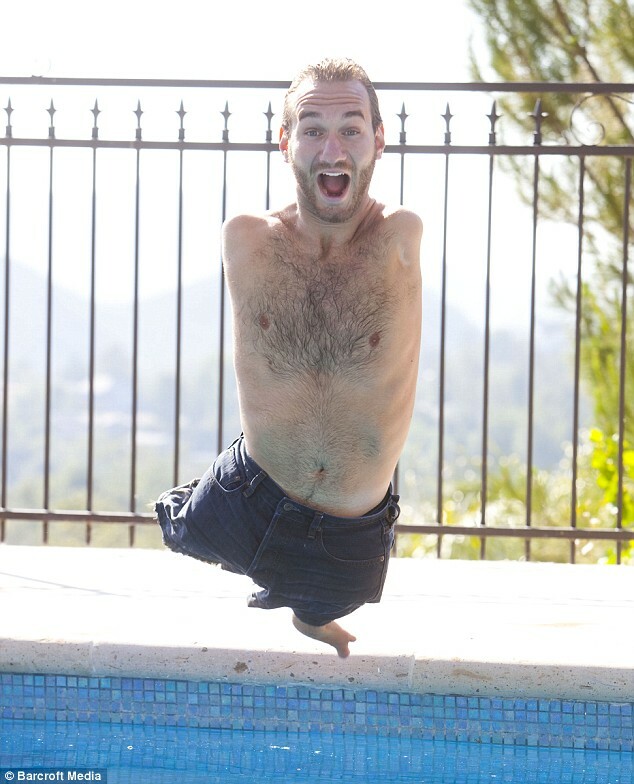 Have you heard of Nick Vujicic? -He’s not a superstar athlete or international movie star. But he is a young man whose Attitude allowed him to succeed under the most dire of circumstances. Nick Vujicic is an internationally known motivational speaker, giving speeches all around the world on the subject of disability and hope. He is the director of an organization, Life Without Limbs, for the physically disabled. He has adopted the attitude of doing whatever he can to give disabled people hope for living as normal a life as they can for one reason. He was born in Australia in 1982 without any arms and legs, just a small foot with two toes protruding from his left thigh. Nick just has a torso, a neck and a head—that’s all! Growing up his life was filled with extreme difficulties and hardships. Australian law prevented him from going to a normal school, but his attitude was that he belonged there. So he wanted to prove that he could do things that would enable him to attend school. He learned to write using two toes on his left “foot”. He also learned to use a computer and type using a “heal and toe” method. He learned to hop around a classroom. Australia soon changed its laws because of his story and he was one of the first disabled students to attend a normal school. But he was bullied at school and become extremely depressed, even contemplating suicide when he was only 8 years old. But he was able to change his Attitude toward life when he realized his accomplishments were inspirational to many other disabled people. His mother also showed him a story on another severely disabled man and it made him realize he wasn’t the only one facing these kinds of challenges. That Attitude made him create his non-profit Life Without Limbs organization. A deeply religious man, Nick has the Attitude that he was put on the earth to encourage and inspire others to live to their fullest potential and not let anything get in the way of accomplishing their hopes and dreams. His goals now are to learn to drive a special car, appear on the Oprah Winfrey Show and write a book. His Attitude is that it’s only a matter of time before he achieves those goals. Nick lacks many things we take for granted—like arms and legs. What he doesn’t lack is the right Attitude to help him succeed and reach his goals.